The Kershaw Vapor III knife model 1655BLKST is coated completely in black oxide. 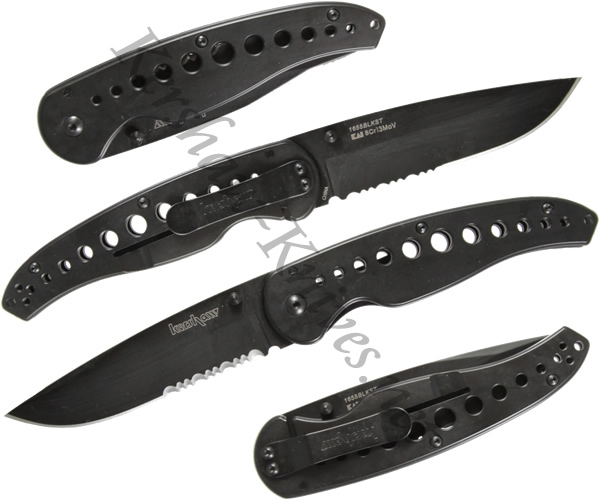 It has a partially serrated 3.5 inch blade that is opened using the ambidextrous thumbstuds. The handle has been drilled to give it a unique look and lighten the total weight of the knife to a mere 4.2 ounces. The handle has a frame lock that keeps the blade open nice and tight while in use. A low profile pocket clip is included with the Vapor III that makes for comfortable carrying both inside or outside your pocket.